Australian Escapes Holiday & Travel Club benefits you with professional travel planning combined with wholesale travel prices. This means your holidays will be more affordable and the real value to you is you can get away more often. Australian Escapes was started by John Greenbury in 2001 in Brisbane to promote discounted resort accommodation packages. The first resort we promoted was Rydges Oasis Resort at Caloundra on Queensland’s Sunshine Coast. In 2002 we started the first travel club in Australia to provide members with access to a wider range of discounted resort options. 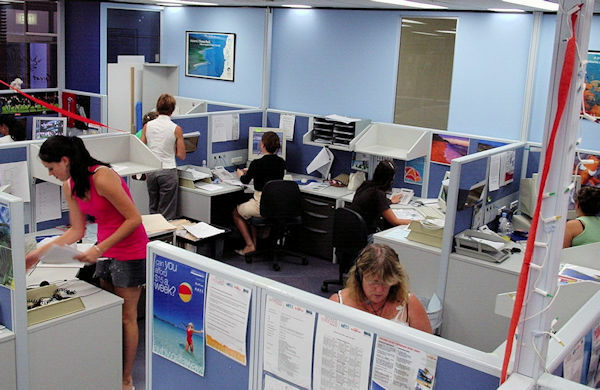 Our Gold Coast office (pictured below) was opened in 2005. Australian Escapes didn’t invent the holiday club concept or discount package marketing for resorts but we did a lot to professionalize the resort marketing industry and we introduced some marketing concepts that have become standard practice today. In 2014 we commenced operations as a full-service travel agency offering members access to significant discounts off domestic and international travel of all types. Australian Escapes challenges online and shop-front travel agent pricing by offering members the same or better service with travel package prices that are 10% to 40% lower. Members are often amazed and even shocked at the price differences. But don't be suspicious, it's simply because we don't have the big retail overheads to support. If you like to shop around online and book your own accommodation that's OK, most of the time you will get reasonable pricing. However when you are planning Australian or overseas travel then know this: non-members paying full retail prices; members pay wholesale, saving sometimes thousands of dollars. Call today to make a booking or enquire about joining and discover how you can save hundreds or even thousands of dollars on your first getaway. Travel Directions Pty. Ltd. operates Global Escapes Travel and Australian Escapes Holiday & Travel Club. The managing director is John Greenbury.